Inspiration comes from many sources, one of which includes other forms of art . Before I became a novelist, I wanted to be a poet, and poetry is still my first literary love. I stumbled upon this beautiful piece by Kenneth Patchen in a textbook called Western Wind: An Introduction to Poetry by David Mason and John Frederick Nims, a fantastic way to learn the ins and outs of verse (if you can stomach the price–yikes!). 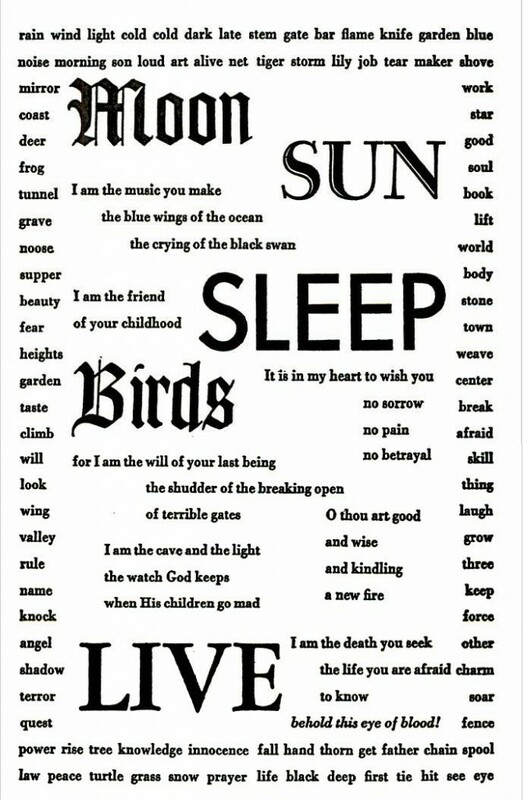 In a discussion on the language of verse, the authors include the poem primarily for its border–a sample of rich words to work from, as opposed to the kind of cliched or pretentious language that clutters bad poetry. Just as bones make for good soup stock, these are the kinds of words that make good stock for poems. In the classroom, I would give my students a copy of Patchen’s work and ask them to create their own verses, drawing at least in part from the words in the border. The results were often surprisingly potent. I gave the exercise a try myself one day (seemed only fair), and the results became the lyrics of this song. I typically start with a melody, composed with the help of an acoustic guitar, then fit the words to the melody’s rhythm. To be honest, it’s been long enough now that I can’t remember which came first for this song–lyrics or melody–but I was happy with the result. The words are certainly surrealist–in the same vein as Patchen’s own verses–but as I’ve said before, you can get away with a level of abstraction in a song that’s difficult to pull off in a poem on the written page. Musically, the biggest thing to note here is that the main guitar line is comprised exclusively of one-finger chords. When I first started song-writing, I couldn’t play guitar very well (still can’t, actually), so most of my songs were composed with chords that only required me pressing down one or two fingers on the fretboard. As in formed verse, though, limitations can spur ingenuity, so I never minded the lack of chops that real guitarists sport. In this endeavor, it was just about writing tunes and having fun. A stone’s throw away weaves the maker of glass. Always seems to be saying this tunnel will end. Turns the shadow of birds into angels. Like a deer whose blue fear tears a tear in my headlight? Your charm’s fateful thorn fills the side of the man? This entry was posted in Uncategorized on August 9, 2013 by David Stahler Jr..